From figurines and art prints to snow globes and walking sticks, displaying Cairn Terrier collectibles is a wonderful way to show the world your special love for this cute little dog. Many people collect Cairn Terrier items as a tribute to a special pet that is part of their family, to honor the memory of a beloved pet that is waiting at the rainbow bridge or simply because they find these cute canine collectibles irresistible. Some collectors search for specific Cairn Terrier collectibles, such as realistic looking figurines, while others surround themselves with collectibles that are whimsical and amusing. There is also a specific group of collectors that only want items that depict Dorothy's Cairn Terrier from the Wizard of Oz, Toto. Exquisitely detailed fine porcelain Cairn Terrier figurines are highly sought after by collectors worldwide. Click on the following links to view examples of these realistic canine, antique collectibles. Two beautiful figurines by Dahl Jensen show a standing white Cairn Terrier and a lovely brown and white one. An adorable figurine by Bing and Grondahl made in 1914 of a sitting Cairn Terrier. Designed by Theodore Madsen, this Royal Copenhagen Cairn Terrier figurine has a beautiful high glaze. Other types of affordable, collectible figurines are offered from a number of websites specializing in dog collectibles and gifts. From tiny Wade statuettes to precious figurine angel ornaments, each one is adorable and unique. 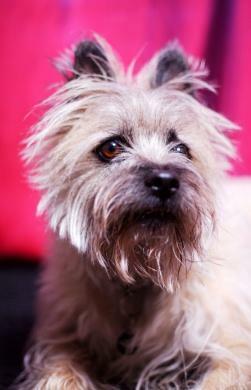 In addition to figurines, there are many different kinds of collectibles of Cairn Terriers. Original and reproduction paintings, prints and posters of Cairn Terriers make beautiful additions to any home decor. The following are several websites offering these beautiful print collectibles. Encore Editions offers magnificent reproductions of book plates, engravings and illustrations by Lucy Dawson, Edwin Megargee and F. Mills. They also offer reproductions of spectacular antique Cairn Terrier paintings by Eugene Joseph Verboeckhoven, Frances Hollams, F. Bailey and other noted artists. Cairn Terrier original framed pages and reproductions by artists including Bridget Olerenshaw, Morgan Dennis and Rien Poortvliet are offered from Dogs on the Net. Zazzle offers a collection of posters and prints that are touching, funny and cute. The Internet provides Cairn Terrier collectors with many excellent websites offering a variety of collectibles. The following is a sampling of these websites. With the large variety of Cairn Terrier collectibles available there is sure to be one that fits perfectly into your collection. They also make great gifts for any dog lover on your list.